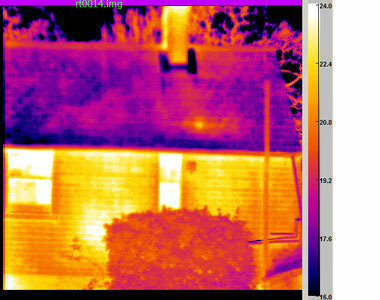 Thermal image of a house light areas show greatest heat loss temp scale on RH edge. 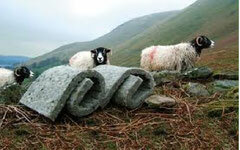 PLEASE NOTE Our thermal property surveys do not employ thermal imaging. The photo is in use to illustrate the point. How large is the temperature difference between the hot and cold side of the material. At what rate do the materials allow heat to pass through. If we think of a typical High Peak winter we know we will have to cope with below freezing conditions from December to February, at least. We will require a system capable of raising the internal temperature to about 19C when it is -3C externally, a total difference of 22C. 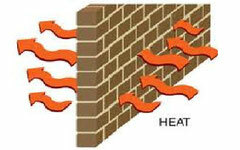 This expensive heat energy will transfer relatively quickly through dense solid materials such as brick and concrete. Over a period of time various thermal insulation materials and systems have been developed to slow the rate of heat leakage. Some of these materials and techniques are very effective and can be applied simply and unobtrusively and will pay for themselves quickly. However, not all properties can be upgraded so simply and rather more complicated methods have to be employed. Almost no property is impossible to upgrade but there is no 'one size fits all' solution. 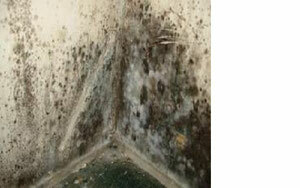 Particular care must be taken at the calculation stage to assess the likelyhood of condensation and dampness occurring. Failure to take account of the effect on moisture movement which any insulation system will have, can easily lead to the emergence of a secondary problem - mould growth, mildew etc. These issues can be avoided by comprehensive assessments and the correct specification of improvement measures.This service takes about an hour in your home and is available subject to preliminary check. Contact us for further details. It should also be borne in mind, that lifestyle factors may need attention too, to realise the potential benefits of thermally upgrading your property. This was introduced to encourage one of the largest generators of greenhouse gases, residential dwellings, in the UK to invest in emission-cutting materials. The lower rate is only available if the energy saving materials are actually installed, and the work is done on your home.